Nestled among the Lidl and kebab shop leaflets the other day was a flier for a company promising to remove the green algae from my conservatory. Not much use to me, then. Beneath that was a promotion offering Two Meals For £10 for somewhere we ain't yet patronised. And patronising is what we do best. Aren't you a sweet li'l waitress? Turn off the A12 onto the Ipswich Road, codenamed B1438, and pretty much the first place you'll hit in Woodbridge, yay even before Notcutts, is The Seal. It may be my wild imaginings, but I thought this place sprang up overnight some years back. 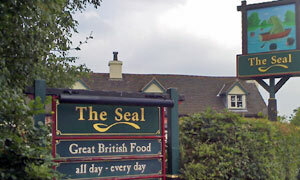 Boom, it's a fully-formed pub with an odd sign depicting a seal in a rowboat (not Max Von Sydow playing chess). There it sits, guarding the road into The 'Bridge with a series of strategically placed picnic tables. Having confirmed that our voucher is current currency, we choose from the range of "pub classics" and retire to the sunlit garden under a reassuringly extensive Artois parasol. Kudos for providing a quality answer to the non-trivial question Do You Have Any Interesting Soft Drinks? They've got some syrups, make unknown, with flavours such as ginger & lemon, which they mix up into good size glasses. Pomegranate & raspberry and lemondate and lime: with ice, v. nice. Weather doesn't quite know what to do with itself after last night's 2:30am thunder and lightning. In no time, food is served in a friendly fashion. Lovely chunky salmon fishcakes with a dressed salad and a bowl of fries. For £5, that's a crazy-like-a-seal price. Sign on the wall proclaims Inn Keeping With Tradition: narf. If it was a car -- MG TF. If they were passing by -- Chris Packham.